These publications are provided for private study; please respect the rights of the authors and if material is to be used in a publication please consult SLHA beforehand. 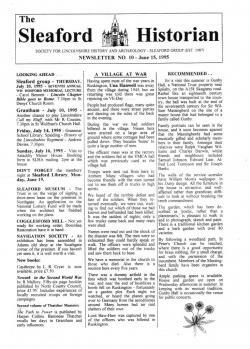 The Sleaford Historian is a monthly news and information sheet published by the Sleaford Group of SLHA. It also includes short articles and book reviews, especially those relating to the south-west area of Lincolnshire. No.33 More on Saint Andrew's Church Kelby; Land of our Fathers? Anglo-Saxon settlers; Why do the British Drive on the Left? 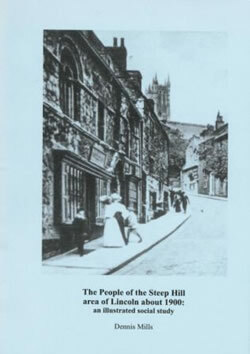 This is the full text of Dennis Mills's book The People of the Steep Hill area of Lincoln about 1900, an illustrated social study first published in 2005. It has been revised and updated for this electronic version. 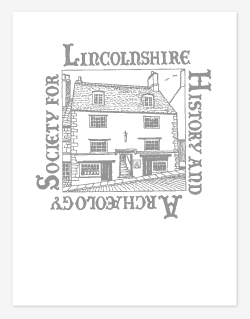 Quarterly Newsletters were published by SLHA from 1974 (the year the new society was established) until the launch of Lincolnshire Past and Present in 1990. This index to the short articles contained in the newsletters was compiled by John Ketteringham. Students of Lincolnshire's history and topography have John Ketteringham to thank for the detailed record he made in the 1990s of over 350 academic studies relating to the county. Some are first degree dissertations; the majority were written for a master's or PhD. The period of writing covers much of the 20th century. Included are many studies relating to Tennyson and Wesley. Download a copy of this index (pdf file 1.08MB). A comprehensive list of articles about Lincoln Cathedral (also compiled by Dr Ketteringham) can be viewed on the website of The Friends of Lincoln Cathedral. Members of SLHA are sometimes involved in fieldwork which, for one reason or another, does not get completed, written up and deposited in a suitable library or archive. There is concern that valuable descriptions, measurements, drawings and photographs of Lincolnshire sites and buildings may be lost. As a first step, members – and any other individuals involved in similar work in Lincolnshire – are asked to let the society know about uncompleted fieldwork they have been involved in by filling in and returning a copy of the Fieldwork Report (one per project). If circumstances make it impossible to provide all the information required, a partially completed form or even a simple note of the project theme and location would alert the society to the existence of the material. Completed reports which have not been deposited should also be sent to Jews’ Court. The format may be paper or digital. Sets of photographs with descriptive captions would also be acceptable. The society intends to deposit copies of fieldwork reports in both local and national archives where long term conservation and accessibility can be guaranteed. Volumes 1, 2, 3 and 4 of Lost Lincolnshire Country Houses were written jointly by Terence Leach and Robert Pacey between 1990 and 1992. Following the death of Terence Leach in 1994, Volumes 5 and 6 (which completed the publishing project) were written alone by Robert Pacey. Terence was unable to complete a parallel account of Lincolnshire Houses and their Families, but two substantial volumes in this series have been published. These books give an exceptionally detailed and useful record of Lincolnshire houses and the families who lived in them. They are illustrated by many photographs and plans. All eight books are available from SLHA, Jews’ Court, 2/3 Steep Hill, Lincoln, LN2 1LS. This comprehensive index, compiled by Elaine Thurgood, includes references to all the family names and to over 140 Lincolnshire houses. There is also a handy location map. Download a copy of this index (pdf file 620KB).